The Jacobite Risings were a stormy period from the late 17th century to the first half of the 18th century in Britain. They involved many plots and battles between those who wanted Britain to remain ruled by Protestants and those who wanted the Stuart Catholics to return to the British throne. Here, in the last of the series, Jamil Bakhtawar follows from his introduction (here) and article on the risings of 1715 (here), to explain how a later generation of Stuarts started the Jacobite Rising of 1745. Painting of Bonnie Prince Charlie by William Mosman. For a generation after the ‘Fifteen’, the Act of Union was not seriously threatened. Jacobitism seldom rallied the forces which had been controlled so inefficiently previously. As the material benefits of the Union were seen, those in the Scottish Lowlands were tempted to follow a different path from the separatists; whilst, the Stuart cause found support chiefly among the Scottish clans. The Jacobite dream of ruling Great Britain flared up again under the leadership of the Old Pretender’s son, Charles. Known as ‘Bonnie Prince Charlie’, the young Stuart began plotting an invasion of Great Britain in 1743. In his eyes, the time was ripe for rebellion. England had recently become embroiled in vast global conflicts; British forces were deployed in Europe while colonists took up arms in faraway places like North America, the Caribbean, and the Indian subcontinent. With all of Great Britain’s concerns overseas, the Bonnie Prince reasoned, they would never expect an uprising at home. 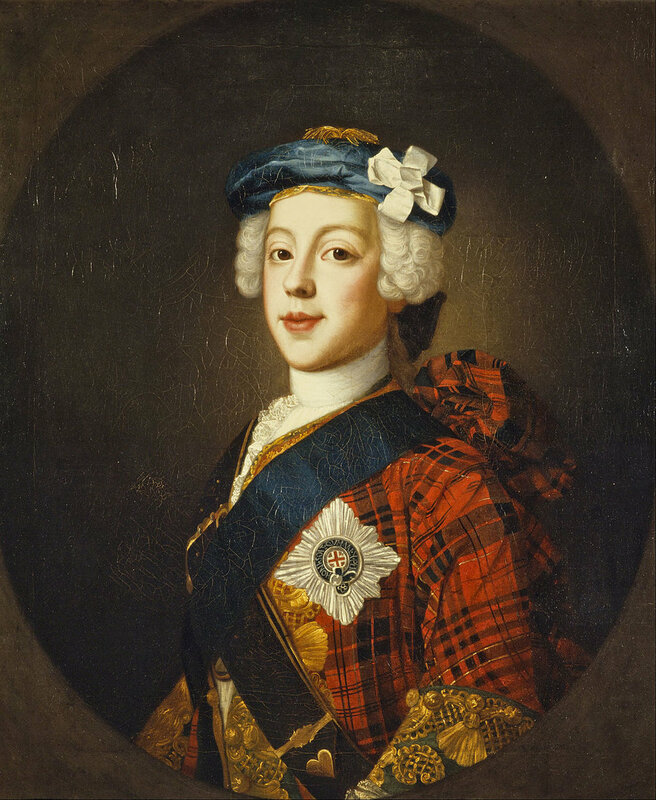 Prince Charles Edward Stuart won the heart of the Scottish Highlanders by wearing their dress and marching at the head of the second division, as strong and unwearied as the best among them. He brought with him his unassailable belief for restoring a Stuart back on the throne. His care for his followers tended much to endear him to them, and his followers adorned him with the graces of a king. Charles cultivated long-distance relations in the Scottish Highlands and amongst England’s Catholic nobility. Guaranteed by Charles that he would be compensated if the risings failed, Chief of the Clan Cameron committed his people to the cause. This led to the support of a few key western clans being crucial to the rising. Without them, the Jacobite standard could never have been raised: with them, the '45 unfolded. The Young Pretender rallied to his standard 10,000 Scotsmen, mostly Highlanders, and captured Edinburgh, thus securing a supply of arms. The rebellion had remarkable initial success. Many Hanoverian troops had been withdrawn to fight the regime's wars abroad, and only a handful remained to defend Scotland. This, plus the general reluctance of the population to martyr themselves for George II (the Protestant heir apparent), allowed Charles to occupy Edinburgh virtually unopposed. Consequently, after a decisive victory over government forces at Prestonpans, the Jacobite Army invaded England by the western route through Cumberland, Westmoreland, and Lanarkshire. Charles besieged Carlisle in mid-November and later entered the city with 5,000 infantry and 500 cavalry troops. After gathering all the ammunition, arms and horses from Carlisle, the Jacobites continued south thereby laying siege to Manchester. Morale inside the Jacobite ranks swelled, and the British throne seemed within their grasp. All told, Charles made a spectacular advance into England, getting as far as Derby. When he reached Derby (only one hundred and twenty-seven miles from London) he found himself threatened by three armies, from the south, north, and east respectively. King George II (the son of George I) recalled his brother, the Duke of Cumberland, from the front lines in France to quell the rebellion. With ample men and resources, the Duke pursued the Jacobite invaders and Charles’ forces were greatly diminished by desertion. On December 6, threatened by superior forces, the Jacobites retreated to Scotland. As the pursuit continued, the Duke of Cumberland and his army landed in Edinburgh in January 1746 and marched on the Jacobites. An already exhausted Jacobite Army was forced to retreat into the Highlands towards Inverness. However, the clansmen did not give up their cause; they awaited reinforcements and kept on their plan to seat Charles Edward Stuart on the throne of Britain. Ignoring advice to launch a guerrilla campaign, Charles chose to stage a defensive action and confront his enemy at the Drummossie Moor, near Inverness. He also ignored warnings that the rough marshy ground may favor the larger Government forces. And so, on a rain soaked morning the Government Army struck camp and headed towards the moorland around Culloden and Drummossie to take up their positions. Over the first half-hour of the battle, Cumberland’s artillery battered the Jacobite lines, first with round shot and then grapeshot. Finally, Charles issued the orders his Highlanders had been waiting for to charge the enemy. The Jacobites were heavily armed with muskets and formed into conventional regiments. They were drilled according to French conventions and some British Army practice. They possessed numerous artillery pieces and fired more rounds per man than the British. Even so, they had no more than 200 mounted men; the British had almost four times as many. Once the Jacobite frontline failed to break the British front at more than one point, their reinforcements were readily disrupted by British cavalry and dragoons on the wings. The Jacobite Army comprised about 5,000, barely a third its maximum strength in the earlier rising of 1745-46 and several thousand fewer than the British. It demonstrated impressive courage and persistence in fighting Culloden, despite being outnumbered. Culloden was difficult for the Jacobites to win, but this manpower shortage – combined with a lack of cavalry – was what made it possible for the British dragoon blades to cut down the Jacobite musketeers. Hence, the Highlanders finally broke and fled; the entire battle had lasted less than hour. Charles’ decision to fight on the most unsuitable terrain possible for a Highland charge had enabled the Hanoverian artillery to cut the Jacobite army to pieces. Indeed, Culloden was a devastating defeat. Several thousand men, some of whom had not been present at the battle, gathered at Ruthven 30 miles south to continue the fight. But a lack of supplies and a failure of leadership from Charles put an end to any thought of a final stand. The Battle of Culloden by David Morier. The Jacobite army at Culloden was organized along regimental lines, with the regiments named after their commanders. They were drilled using a mixture of French and British tactics and possessed a large amount of artillery. The battle of Culloden had to be fought because the Jacobite Army needed to protect Inverness, its last major supply depot. As it was, supplies were low and Charles’ army was too large and conventionally organized to fight a guerilla war. Nor was it a ‘clan-like' army; many of its units were from the Scottish Highlands, as well as Irish and Scottish soldiers in the French service, and some English volunteers. Indeed, at Culloden some of the most effective units were non-Highland ones. Ironically, the government repression after Culloden was as unnecessary as it was brutal. Many former Jacobites were only too willing to seek terms with the State. Within a relatively short time a large number of them were to be found serving the Hanoverians in a military capacity abroad. Jacobitism had been exposed by the '45 as no longer militarily viable. With the exception of a few half-hearted plots, it continued withering away. The defeat of the Jacobites had led to the rolling out of a new British government policy: the attempted extinction of Stuart support in the Highlands via the systematic dismantling of the ancient social and military culture of the Highland clans. The wearing of Highland garb, particularly tartan plaid, was banned and the semi-feudal bond of military service coupled with the power of the chiefs over their clans was removed. Understandably the British government wanted to stamp out any potential of another rebellion occurring. However, the uncompromisingly ruthless and often violent manner in which this was achieved - including the destruction of property and livelihood, executions and transportation - swiftly turned the joy at the rebellion’s termination into sympathy for the rebels and, soon after, disaffection towards the government. The Duke of Cumberland’s enthusiastic leadership in this process won him the soubriquet ‘The Butcher.’ Thus, the pacification of the Highlands and the channeling of Highland military prowess into the British Army largely removed any potential for a future uprising in the area. Culloden was seen as the final battle in an Anglo-Scottish conflict. It was the precursor to the Highlands becoming the last part of Scotland to be fully incorporated into Great Britain and, most importantly, the British Army. This helped underline the sense of Jacobites as aliens: Gaelic-speaking Catholics in an English-speaking Protestant country. Culloden was, of course, the true end of a long civil war, as was the Anglo-Irish war of 1919-21 or the American War of Independence. Every national struggle divides its nation, and the Jacobite uprisings were a fight not only for the restoration of a Catholic monarchy but also for an independent Scottish nation.